VH-OTV at Broome - YBRM, Western Australia. • IM-1731 Indian Air Force. Delivered 22-Apr-1958. Assigned to 41 Squadron (Otters) based at Palam, New Delhi, Punjab between 1976 to 1980. Removed from inventory on 31-Mar-1991. • Un regd Mike Hackman Aircraft Sales / La Ronge Aviation, Dec-1995. • C-FWYH Springer Aerospace Ltd., Sault Ste. Marie, ON. Based at Bar River, ON. Regd 27-Nov-1995. Canx 18-Dec-1995 on export to USA. Power plant. Converted to Vazar turbine at Wipaire. • VH-OTV Broome Aviation, Broome, WA. Regd Nov-1997. • VH-OTV Vazair Pty., Ltd. , Broome, WA 23-Feb-2006. • VH-OTV Caneflight Aviation, Derby, WA. Regd 05-Feb-2008. • N510PR Talkeetna Air Taxi Ltd., Talkeetna, AK. Regd 11-Feb 2008 & 12-Dec-2008. Noted in container at Talkeetna 17-Dec-2008. Otter 250 was delivered to the Indian Air Force on 22 April 1958 with serial IM-1731. After test flying at Downsview it was packed into a crate and shipped to India, where it was re-assembled and entered service. All that is known of its Indian service is that it flew with 41 Squadron, based at Palam Air Base, New Delhi during the years 1976 to 1980. The Indian Air Force continued to fly the Otter until the type was formally withdrawn from the inventory on 31 March 1991 and the surviving aircraft offered for sale. The successful bidders for the Otters were Mike Hackman Aircraft Sales / La Ronge Aviation, who travelled to India to prepare the aircraft to be shipped back to Canada. IM-1731 was located at Gwuahati Air Base and had 7,576 hours on the airframe. It was one of four Otters shipped from Calcutta on 15 December 1994, which arrived at Saskatoon late January 1995. The Otter was sold on to Wipaire Inc and was transported from Saskatoon to the facility of Springer Aerospace Ltd at Bar River, Ontario who rebuilt the Otter. It was registered C-FWYH to Springer Aerospace on 27 November 1995, on completion of the rebuild. This registration was brief, for the purposes only of test flights and its transfer to the United States. On 18 December 1995 the Canadian registration was cancelled and the Otter registered as N373A to Wipaire Inc., Inver grove, Minnesota. Wipaire Inc are a leading manufacturer of aircraft floats. At their hangar number 7, Fleming Field, South St.Paul, Minnesota N373A was converted to a Vazar turbine Otter, with a PT6A-135 engine, and was fitted with a set of Wipline 8000 amphibious floats, certified for use the previous April on the Otter. It also received a state-of-the-art radio package. In October 1997 it emerged from the hangar, ready for its delivery flight to its new owners in Australia, to whom it had been sold by Wipaire through brokers Scott Aircraft Sales. It was painted white with a maroon cheatline and tail stripe and Broom Aviation titles on the fuselage. The mammoth task of delivering the Otter from St.Paul, Minnesota to Darwin, Australia was entrusted to Southern Cross Aviation of Camarillo, California, a specialist aircraft ferrying company. Routing of the flight was from St.Paul-Saginaw, Michigan-Andover (for the installation of the ferry tanks)-Bangor, Maine-Gander, Newfoundland-Santa Maria, Azores-Valencia, Spain-Iraklion, Crete-Luxor, Egypt-Muscat, Oman-Male, Maldives-Colombo, Sri Lanka-Penang, Malaysia-Bali, Indonesia-Darwin, all of which took 138 flying hours. The routing after Muscat would normally have been to Madras in India then Penang, Malaysia but the Indian authorities at that time were requiring very complicated and time consuming authorization procedures to land in India, so it was quicker and more practical to route around the southern tip of India. Had it landed in India it is interesting to speculate if anyone would have recognised this brand new looking turbine Otter with its massive amphibious floats as the humble recip Otter which had served the Indian Air Force for more than thirty years. At Darwin N373A was registered VH-OTV on 13 November 1977 to Vazar Pty., Ltd., of Broome, Western Australia, trading as Broome Aviation and made the relatively short flight to its new base at Broome. From here it supported a commercial pearling operation which, apart from tourism, is the biggest industry in this part of Australia. 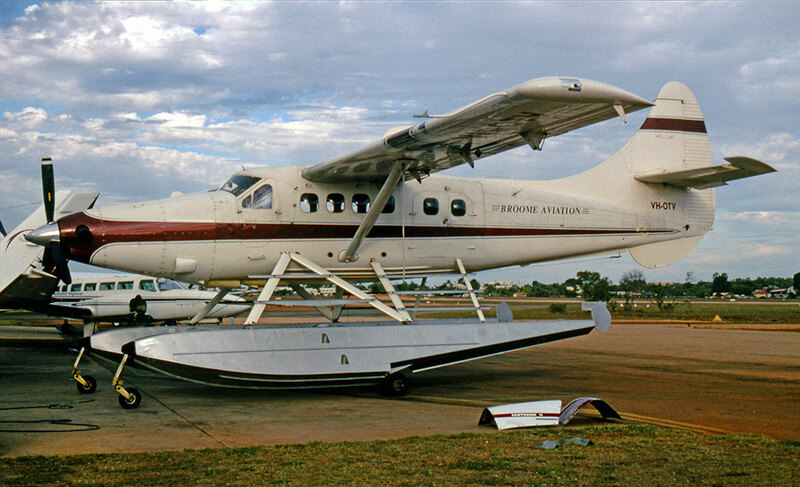 The Otter replaced a Cessna 206 and was flown from Broome Airport on its amphibious floats. The pearl farms are located 126 miles north-east of Broome, around the Buccaneer Archipelago. The Otter flew out to the farms three times a week with replacement crews, who work two weeks on/one week off. On the days it was not engaged on these crew changes, the Otter flew tourists out from Broome to see the pearl farms. It averaged twenty hours flying a week. The Otter was noted at Broome on 19 May 2005, just out of the hangar after overhaul and repaint into a new scheme of white overall, red cheatline and red line across the tail, ready to continue its flights to the pearl farms. An incident was recorded on 15 February 2006. VH-OTV departed Broome that morning for a charter flight to Cone Bay with a pilot and five passengers on board. Shortly after commencing a planned descent from its 9,500 feet cruising altitude, the pilot reported feeling an unusual movement within the elevator control system. At 6,500 feet the aircraft suddenly and rapidly pitched downwards. Initial attempts by the pilot to arrest the ensuing descent by pulling back on the control column were unsuccessful. However, after enlisting the help of a passenger seated in the right front seat, the pilot was able to regain sufficient authority over the elevator to arrest the descent and return the aircraft to level flight. The pilot declared a “Mayday”. A nearby Coast Watch aircraft responded to the Mayday and advised air traffic control of the Otter’s difficulties. After regaining control, the pilot continued the flight to Cone Bay, electing to proceed to the Lombadina station authorised landing area for an immediate landing. To alleviate the fatigue resulting from the sustained control back-pressure needed to maintain level flight, the pilot instructed another passenger to take the right seat for the descent and landing. The Otter was then flown through a “high but otherwise normal” approach. With the additional assistance of the front seat passenger during the flare, the pilot was able to land the aircraft normally and taxi clear off the airstrip. Inspection revealed that the right elevator servo tab had disconnected from the control horn and actuator rod. This was repaired and the Otter returned to service. On 23 February 2006 the Otter was re-registered to Vazar (Pty) Ltd., of Broome and given titles www.reefflight.com.au on the fuselage side. According to this website, Caneflight Enterprises Pty., Ltd., is a company managed by a Rod and Lee Johnston and Reef Flight is one of the operating names used by the company, which located in Broome when the company won the contract to operate the Otter on behalf of Broome and Maxima Pearling Companies. The Otter continued in use for the pearl farm crew transfers and for tourist flights. The company also operated a Beaver and a Cessna Caravan. In December 2007 Otter VH-OTV was advertised for sale, on Wipline 8000 amphibious floats, with 13,610 hours on the airframe. It did not sell at that time but continued in operation out of Broome. It was again advertised for sale in December 2008, by when the total time had increased to 13,974 hours. The price was reduced from US$1,495,000 to $899,000. The Otter was sold that month to Talkeetna Air Taxi Inc., of Talkeetna, Alaska and registered to its new owners on 12 December 2008 as N510PR. The Otter was noted in two containers at Broome on 24 December 2008, about to be shipped to Seattle, for re-assembly and delivery to Alaska. By May 2009 it had been re-assembled, painted in the same colour scheme as the company’s existing Otter N565TA (46), which was a red upper fuselage, blue lower fuselage and white cheatline, and named “Sheila”. It entered service alongside N565TA for the summer of 2009, and was later joined by further turbine Otters N100BW (58) and N2YV (207). A minor incident was recorded on 14 June 2017 when one of the skis of N510PR caught on a crevasse on landing on a glacier in the Denali National Park. The damage was soon repaired and the Otter back in service.